Like many food bloggers, I am frequently contacted by PR folkies asking if I’d be interesting in sampling/reviewing whichever cheese or book or knife or chocolate or whatever they are currently responsible for selling. My response is always the same: I prefer to keep my blog promotion free so, thanks but no thanks. (Can you sense a “But” coming??) But when I was asked whether I’d be interested in reviewing a restaurant in Aberdeen that I’d been hoping to visit anyway , I crumbled. And my, am I glad I did! Malmaison Aberdeen is a hotel and restaurant located in the elegant west end of the city. One of a chain of twelve UK hotels, the Malmaison group has a reputation for being modern and stylish. 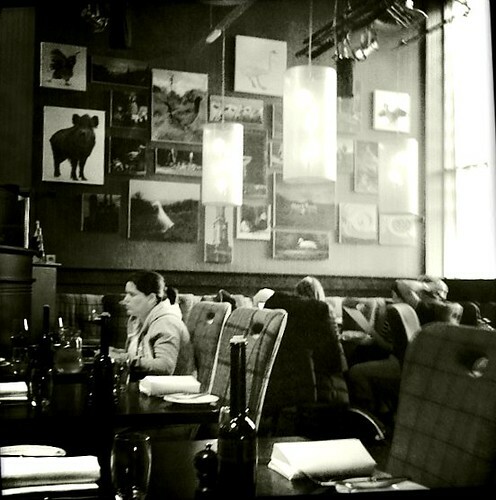 All reports I’d heard from friends and colleagues about the brasserie in Malmaison Aberdeen had also been glowing and so I had high expectations of our lunch experience. We arrived on a driech Saturday afternoon in October – nowhere else on earth does “grey” like Aberdeen in the rain – and were welcomed into the restaurant. For some reason (the website?) I was expecting a cavernous dining room with dark walls, neon lights and rich velvet materials. In reality, the restaurant is a beautiful, big, airy space with lots of glass, industrial looking lights and lavender grey walls adorned with enormous, quirky pictures of animals. The wood was dark and the chairs were covered in Anta-like tartan. The overall effect was plush and welcoming. The service too was highly polished and very friendly. I can be a bit of a woose when it comes to aloof, experienced waiting staff and have, many a time, felt rather intimidated. 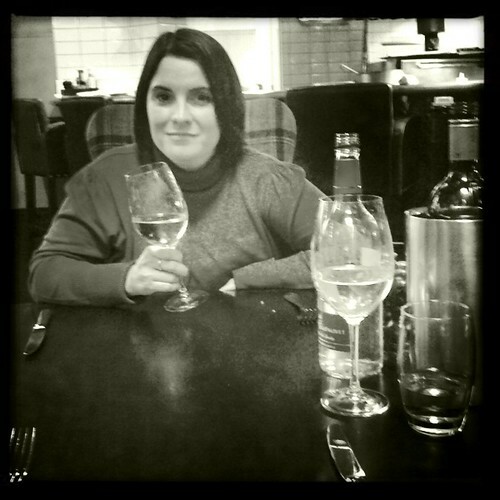 (The most notable time being in a posh restaurant in Belgium when I snaffled the mini tester glass of wine the sommelier was intending on inspecting. Never have I received such a look of disdain!) But everyone in the hotel we came into contact with was both professional and warm. Being seated at a table very near the open kitchen enabled us to nosey continually at the food that was being served to the other diners before ordering our own choices. For a starters Gen had the pretty Roasted Squash and Beetroot Salad and I ordered the Twice Baked Goats Cheese Souffle. Both dishes were outstandingly good. For our main courses, Gen had the Sole Goujons which were served in a cute wire basket along with a generous amount of big, chunky chips. It looked great but the basket did make the meal a bit of a fouter to eat. I went for the Lamb Kebabs with Spicy Aubergine. Though maybe a little too charred, the meat was tender and flavoursome and the aubergines were amazing. I would happily have eaten a plate of the aubergines on their own! Served along with two specially selected dessert wines, dessert was delicious. 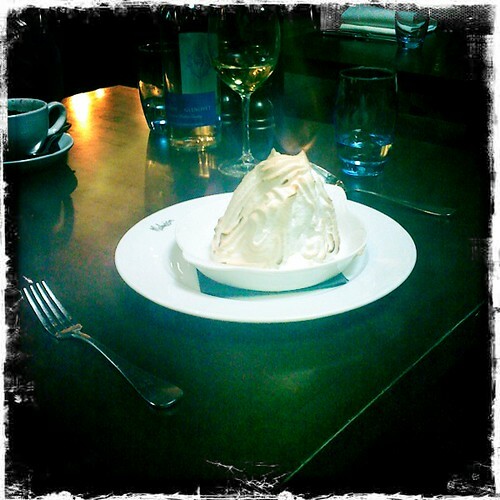 Gen’s Tiramisu rivalled her mother’s (praise indeed) and my Baked Alaska (which was huge and really should have been shared) was spectacular. A couple of espressos with a tiny pot of chocolate finished our meal. Perhaps the highlight of our visit to Malmaison Aberdeen came after lunch. Somellier Martin Murphy gave us a tour of the restaurant’s white and red wine stores (which are visible to dinners in the glass lined corridors). 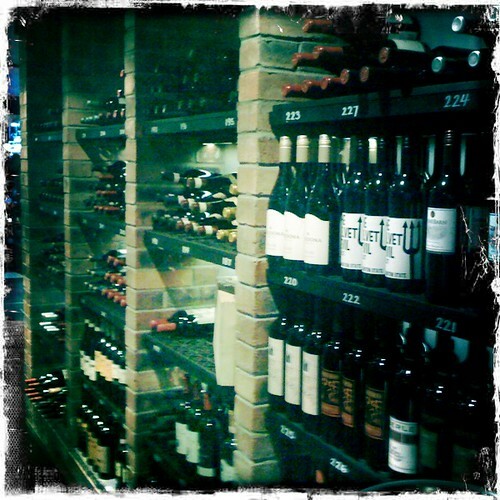 There were literally hundreds of wines from all over the world, many of which were handpicked by Martin himself. The man knew his wine. I don’t know mine at all so the offer of a wine tasting session in the cellar was accepted eagerly. Informal, chatty and informative, Martin talked passionately about three different wines: the grapes, the regions, the characteristics, the winemakers… I could have stayed down there all day. We didn’t though; I had a train to catch and we were both very full and slightly drunk. We walked happily to the train station in the drizzle, chatting about how we’d like to return to Malmaison, how the wine tasting would be a lovely gift for someone and about what a lovely afternoon we had just had. You would make an excellent reviewer of restaurants! Sounded like a very enjoyable experience. we love the Mal hotel chain and have made it our mission to visit all of the brasseries in our lifetime (quite a tall order since none are that close to us but we’ve managed 3 in the several years since our first visit to Glasgow) . The food is great and as you say a select choice but the veggie food options never disappoint.